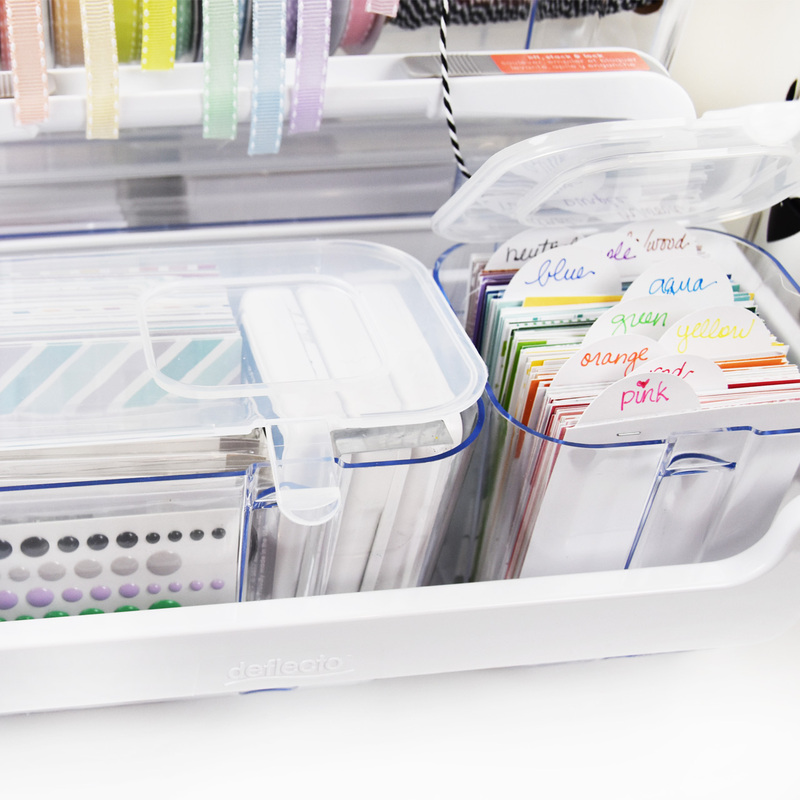 I was super thrilled to be asked to try out some cool craft storage and organization products by Deflecto LLC by Scrapbook.com! 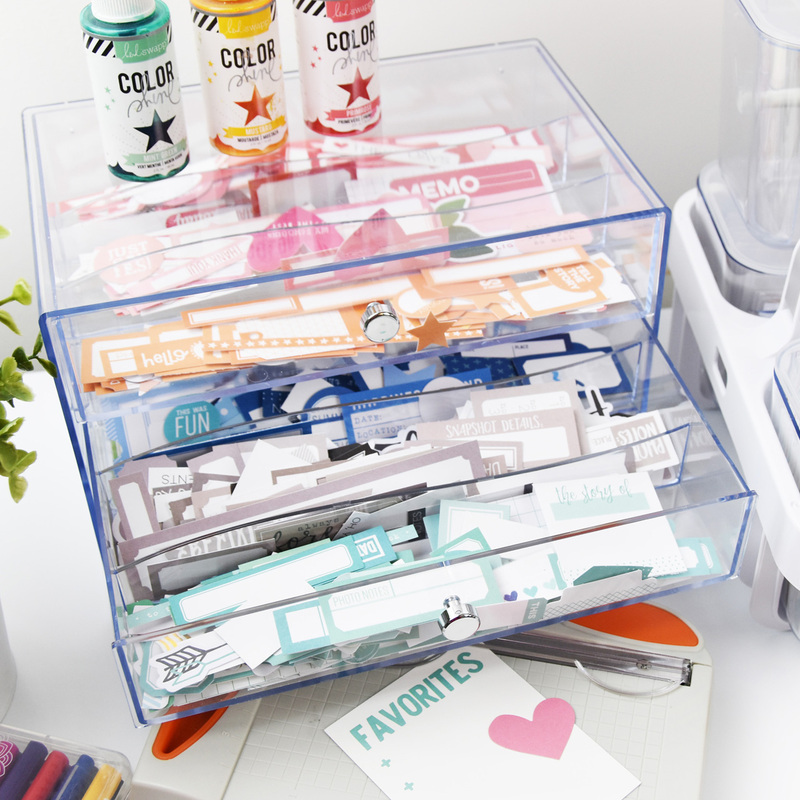 I instantly said yes as my crafty space is constantly changing and shifting for my memory keeping and crafty needs, and who can’t use great storage solutions? Historically I have not invested in quality storage, but in the last year, I started to incorporate it into my home. 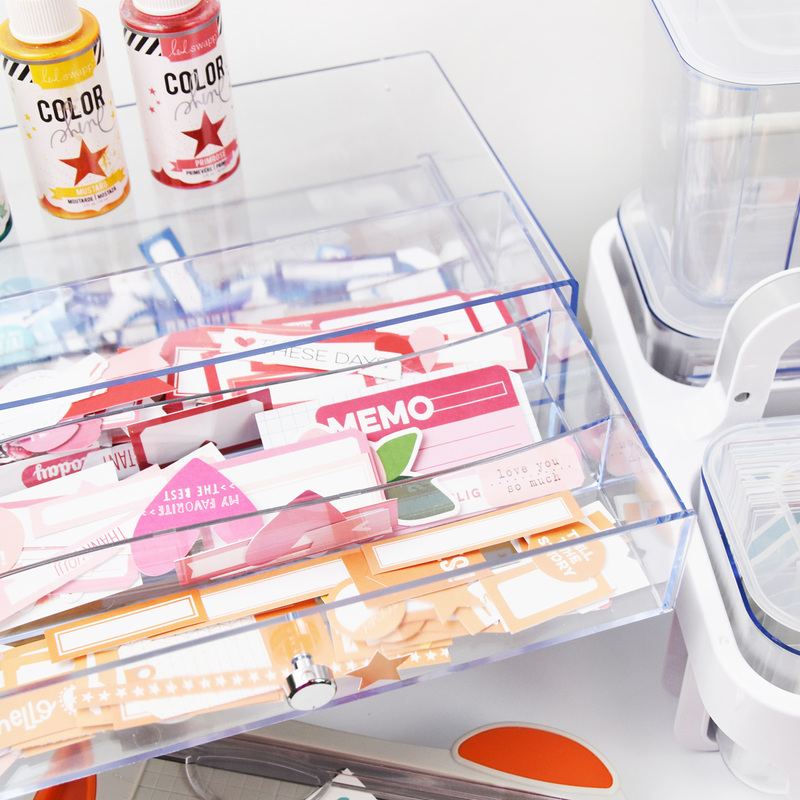 I started with buying a lovely acrylic makeup organizer, and I couldn’t believe how much better the items looked and how much more convenient the storage made the items. So with that in mind, I was excited to try out the items I was sent! 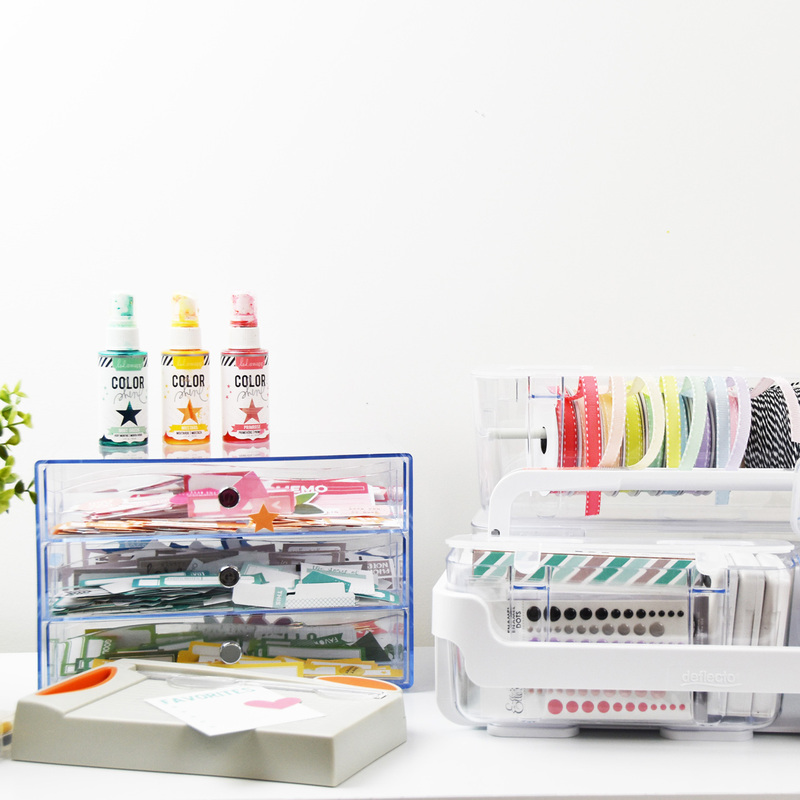 The first item I unpacked was the Deflecto – Washi Tape Storage Cube. The first thing I did was stuff it full of washi! It had to be done! 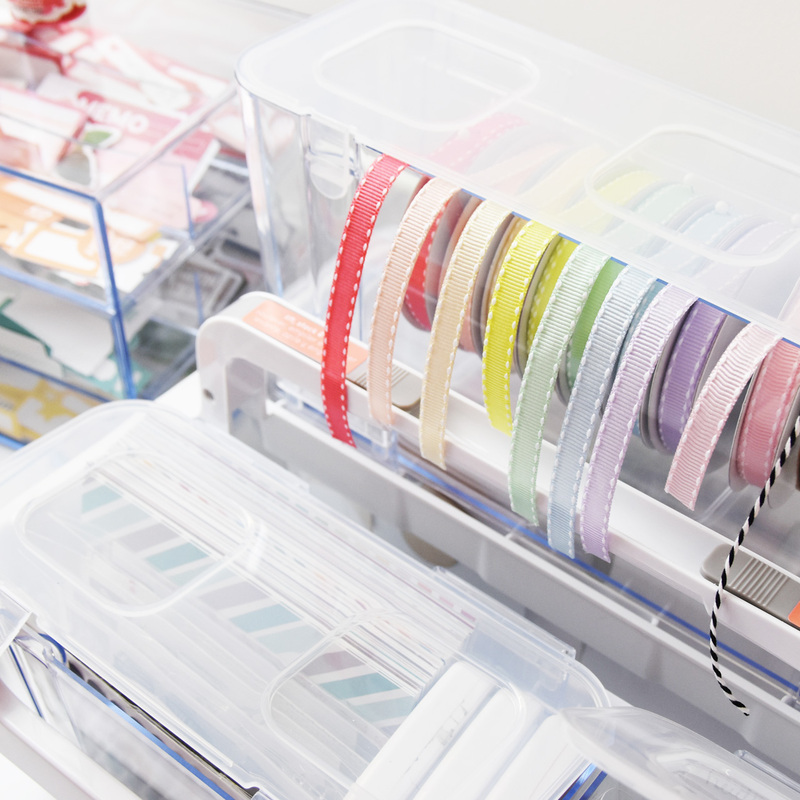 The washi fits beautifully of course and looks great; it would remind any crafter to use their stash of washi because it is easy to see and grab. 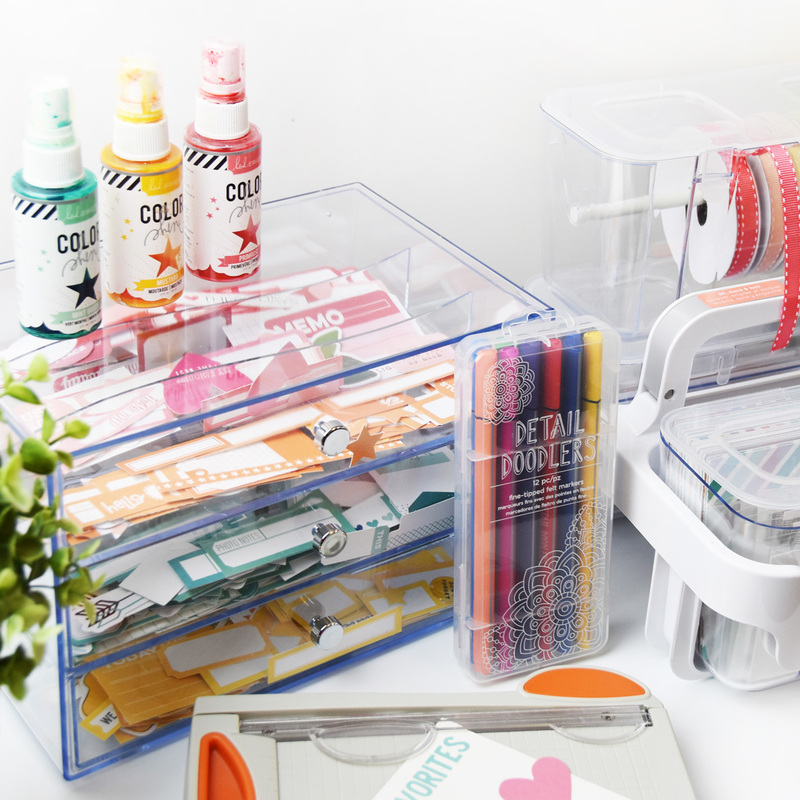 The only trouble for me is that I rarely reach for washi, it looked great, but I was bound and determined to make full use out of the storage cube. 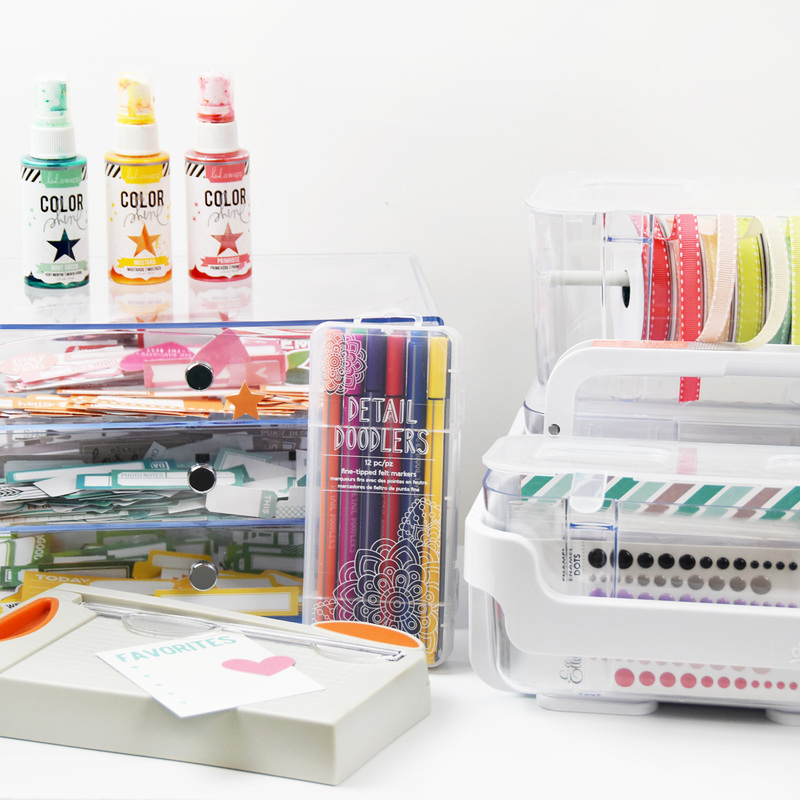 As I fiddled around and with the Deflecto Caddy Organizer, I had it full of mixed media supplies, then I tried stitching supplies, and none of them were quite right. I sat back for a minute and thought about what I wanted to improve or work on in my memory keeping and realized that I haven’t been working on my pocket albums nearly as much as I used to. My scrapbook and mini album supplies had kind of taken over the premium spaces in my workspace, and I wasn’t digging out the supplies for pocket albums. With that realization, it came together so quickly! I use a lot of Elle’s Studio products in my pocket albums and had most of my stash sorted into color. The Washi Tape Cube was the perfect solution for my die cut and small embellishment stash. Each drawer has three sections, so I used one section per color. One thing I love is that the drawers come right out to make it easy to access all the sections. You can also have the one drawer be closer to the project you are working on and then quickly put it back! 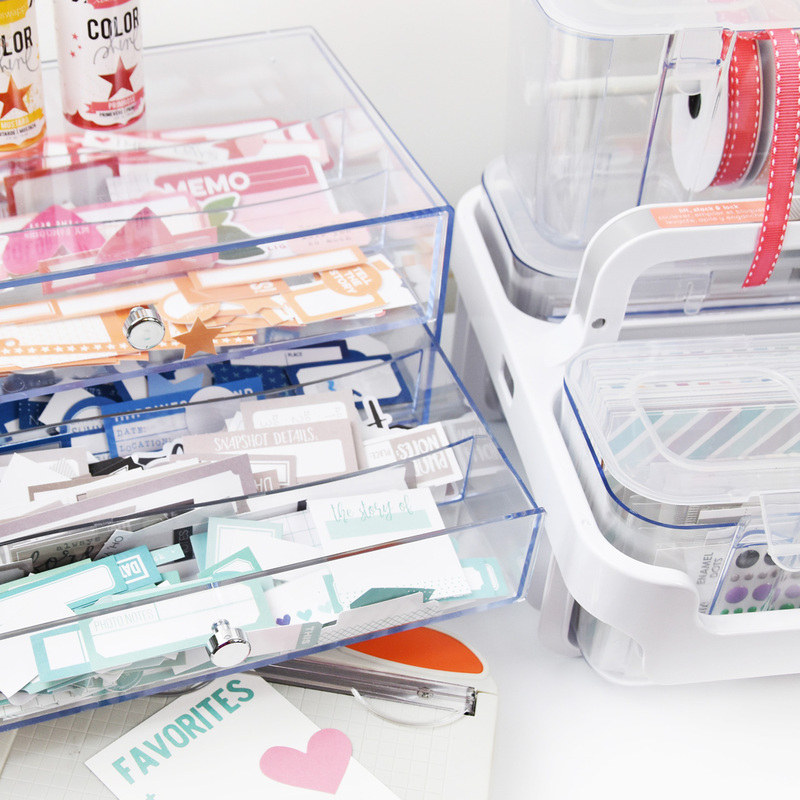 I love that I have nine sections of organized, ready to use die cuts, labels, and embellishments! 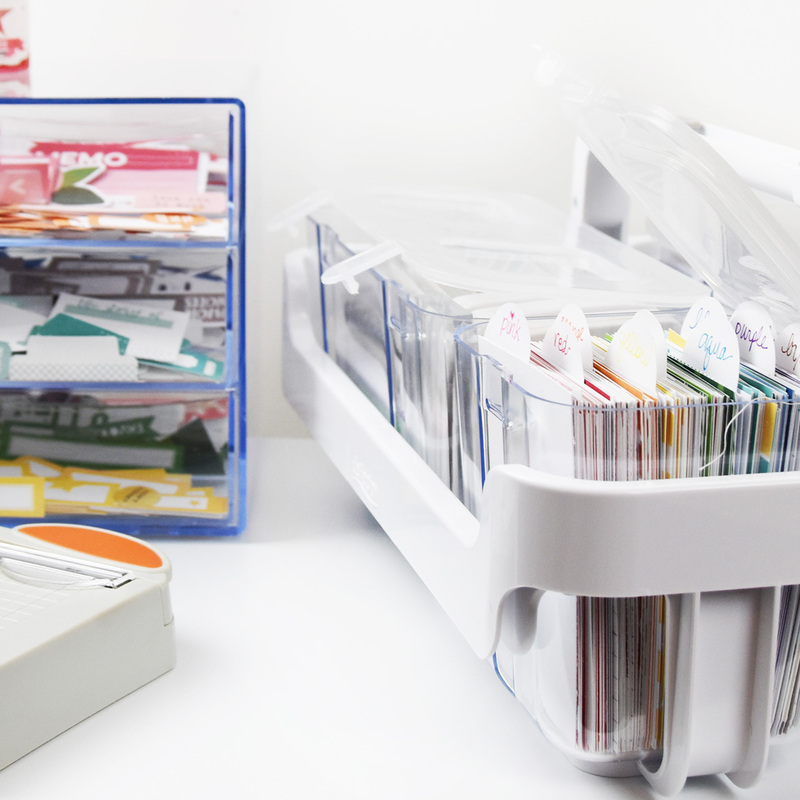 Next up I worked on the Caddy Organizer, I have the one with three compartments – small, medium and large. The caddy is stackable, and you can also get a base with wheels on it, to make your storage mobile. To the medium container, I added my 6×4 cards, stamps, enamel dots, three ink pads, and an acrylic stamp block. You sure can pack a lot of items into the containers! To the small container I added my 3×4 journal cards, they fit in the container perfectly! For the large container on the other side, I added larger stamp sets, wood veneer, acrylic embellishments a tape runner and a tiny attacher. I have everything I need to have both units upstairs in my home (craft room is downstairs), so I can easily work on pocket albums anytime I like! Side view packed full, but still enough room to rifle through the cards! I also received the Deflecto Ribbon Dispenser, I filled it with co-ordinating colored ribbon to my cards and embellishments and also added a black and white twine. 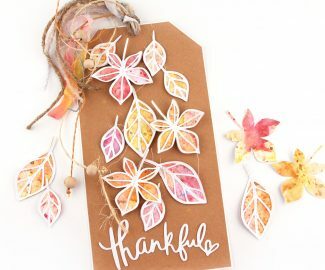 I love to add ribbon to tags for another pop of color and texture in my albums. The cool thing about this container is that the ribbon component pops right out and you could use the container to store different items! I am really happy with how it all worked out! If you have any questions about the Deflecto storage, I am happy to help! Many thanks to Scrapbook.com for the lovely storage! !